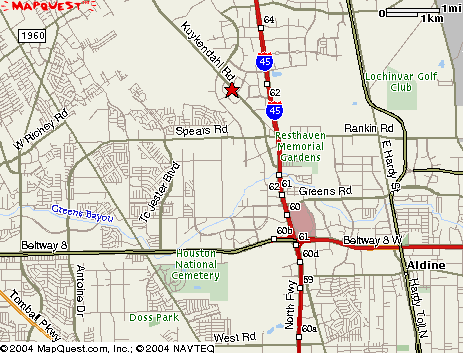 Our classroom is conveniently located near I-45 and the North Beltway 8. Please Note: When arriving for class, please park in the middle of the parking lot (not in front of our neighbor's storefronts). Thank You. Please Note: This is the classroom where each class will begin. If you would like to register in person, the classroom is open for registration Mon-Wed-Fri (10:00am-2:00pm). From I-45 going North: Take the Airtex exit. Turn left at the light (Airtex), go 7/10 of a mile.. At the first stop light (Ella), turn left, go 2/10 of a mile. At the first light (Kuykendahl), turn left. Go 2/10 of a mile. On the right, you will see a Spec's, a Divison 1 Sports Bar & Grill and a strip center. We are in suite 105. From I-45 going South: Take the Airtex exit. Turn right at the light (Airtex), go 7/10 of a mile. At the first stop light (Ella), turn left, go 2/10 of a mile. At the first light (Kuykendahl), turn left. Go 2/10 of a mile. On the right, you will see a Spec's, a Division 1 Sports Bar & Grill, and a strip center. We are in suite 105. From FM 1960 going East: Turn right on Kuykendahl. Go 2.2 miles to Ella. Continue straight through the light. Go 2/10 of a mile. On the right, you will see a Spec's, a Division 1 Sports Bar & Grill and a strip center. We are in suite 105. From FM 1960 going West: Turn left on Kuykendahl. Go 2.2 miles to Ella. Continue straight through the light. Go 2/10 of a mile. On the right, you will see a Spec's, a Division 1 Sports Bar and Grill and a strip center. We are in suite 105.